The Mapping Digital Media project examines the global opportunities and risks created by the transition from traditional to digital media. Covering 60 countries, the project includes data on how these changes affect news about political, economic, and social affairs. Visit the Open Society Foundations’ website to see the full version of each country’s report. CIMA worked with the Open Society Foundations to identify the most important digital media indicators in the series of reports. 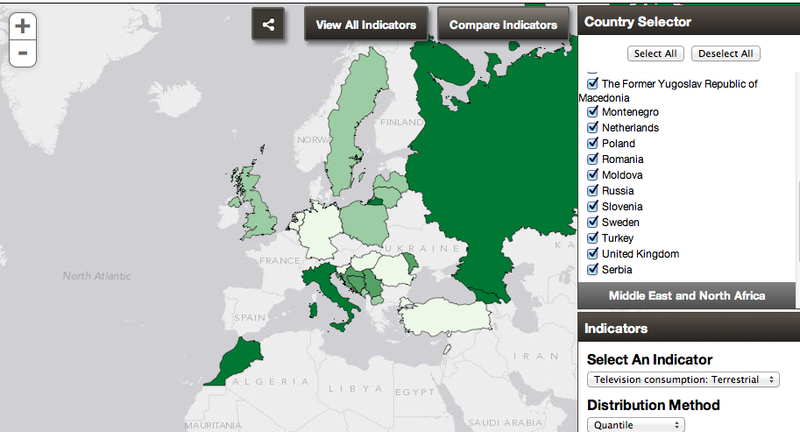 The mapping tool allows for the visualization of these indicators from each report and enables the comparison of digital media penetration in various countries. Please note that some data from the reports has been recalculated to ensure that comparable data is presented in the map.